Being a high school English teacher and a YA book reviewer, I'm always on the lookout for the next book I can teach in my classroom, and believe me, there is a long checklist of what a book must have to be worthy of my fastidious students. Since The Hunger Games, I've been hard pressed to find a book that excites them. Divergent was a success, but the sequels fell flat. 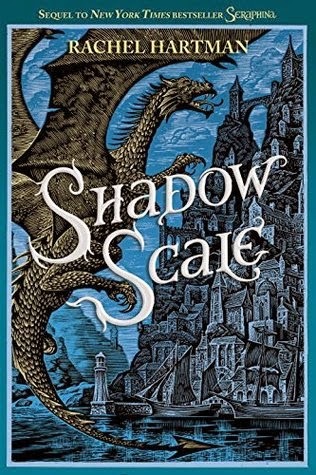 I'm not sure what took me so long to find Seraphina, but I am so very glad I did, and I cannot wait to share with my students and colleagues Seraphina's adventures here and in the sequel Shadow Scale (review coming soon). It's been forty years since humans and dragons have signed a treaty to coexist peacefully. Dragons, considered to be inferior, can transform into humans, which eases fears, but they do not carry the same emotions as humans, and people often exacerbate the problem with emotional hyperactivity. Seraphina is awkward and anti-social but so musically gifted that she's well known in Goredd. Thinking it to be the opportune moment, Seraphina joins the royal court and anxiously awaits the anniversary of the peace treaty; however, the prince has been murdered, and it looks like dragons are to blame. Having an uncanny knowledge of both humans and dragons (you must read the book to discover that secret), Seraphina becomes more important than she ever thought possible, and the responsibility of continuing the peace between dragons and humans will be placed into her hands. From the very first chapter, I knew this book was special, and I kicked myself knowing that I missed three years of being a part of its legacy. But I've read it now, and I can honestly say that it is one of the most beautifully written and intelligent YA books I have read in a very long time. As an adult, I haven't been challenged by a book since college, and Hartman's prose puts me right back into one of my favorite fiction classes at Clemson. How I would love to sit down and analyze this book with a group of teens and adults! (And I may just suggest that to my librarian). Reminiscent of Tolkien's Hobbit and Carroll's Alice, Hartman takes readers on such an intricate adventure that the glossary and list of characters in the back are absolutely necessary. It's not that the plot becomes convoluted, but the beloved characters, names, and places are so vital to the story that understanding them becomes paramount. Particularly of note, Seraphina's garden, that she tends every night before sleeping, is perhaps my favorite section. Such "grotesque" imagination there. 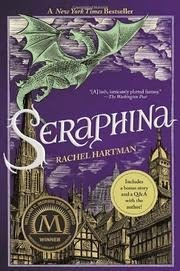 This is not just another dragon story, and really the dragon aspect is only part of Seraphina's journey. Psychology and philosophy meet science fiction and fantasy in a book that I won't forget anytime soon. In fact, I'm diving into the sequel right now.